Key Difference: A solar flare is a sudden flash of brightness observed near the Sun's surface. It results in an emission of X-rays and energy. CME are types of explosions that occur on the surface of the sun. A CME releases a large amount of plasma and magnetic field. Space, the final frontier, is a fascinating place. It is vast, dangerous, and beautiful. However, while a spaceship does not exist as of yet that can allow us to view these magnificent landscapes with our own eyes, we can only rely on images that space agencies such as NASA have graciously released to us. 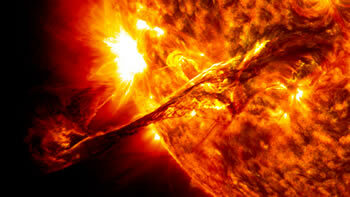 However, one may have noticed that when images of the sun are released there are often bursts on the surface of the sun. They are commonly referred to as a Solar Flare or a CME? However, what is the difference between the two. Both, a solar flare and a CME are types of explosions that occur on the surface of the sun. they usually result in a sudden flash of brightness that appears near the Sun’s surface. There are times that they may even occur at the same time, however they are not the same. They are two different things. A solar flare is a sudden flash of brightness observed near the Sun's surface. It results in a very broad spectrum of emissions being emitted from the Sun. These giant bursts generally include X-rays and energy that tend to travel in all directions at the speed of light. CME, stands for Coronal Mass Ejection, which may appear as another type of flash of brightness. However, instead of emitting X-rays and energy, a CME releases a large amount of plasma and magnetic field. It can be said that they are giants clouds of particles that are being thrown out into space. CMEs tend to occur first, and are often followed by solar flares. It takes about one to three days for the particles released in a CME to reach Earth. Whereas, flares tend to take only eight minutes as they travel at the speed of light. In order to distinguish between the solar flare and a CME, it should be noted that flares are flashes of light on the sun, whereas a CME is an eruption out into the space. CMEs also tend to primarily occur at active regions, such as where sunspots are grouped together. A CME is often immediately followed by a solar flare. 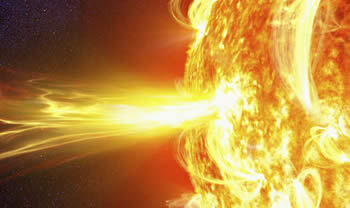 A solar flare is primarily an energy release. One major solar flare can release 1 × 1025 joules of energy, i.e. the same amount of energy as 1 billion megatons of TNT. While a CME is often accompanied by a solar flare, a solar flare can occur without the presence of a CME. Travels at the speed of light, and hence takes only eight minutes to reach Earth.